Here’s a recipe of mine for Chili With Bok Choy... you’re gonna love it! I am a big fan of replacing regular table salt with sea salt. Sea salt is not processed very much, allowing the minerals (and there are many) to remain in a state in which the human body can easily process them. Salt actually can help with various skin conditions, is good for your teeth, helps with some painful eye condition and can help stave off muscle cramps. It helps with digestion and it lessens the effects of food poisoning. Salt is actually a Chinese herb called Mang Xiao and is used to treat constipation and eye conditions. Just plain bok choy. It's simple and it's deliciously healthy! One huge bag of baby bok choy. Add about 1-inch of water to a large pot. Add lots of sea salt and bring it to a boil. Drop in the bok choy and the ginger. Give it a stir to make sure it's all wet. Cover the pot and lower the heat a bit. Let cook a few minutes, then uncover and stir it up. 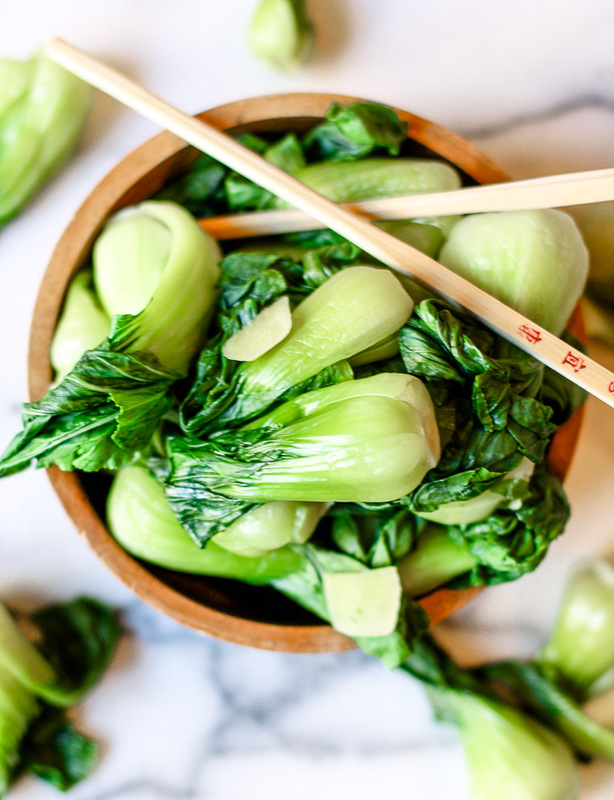 Check your bok choy after a few minutes, because as soon as it's how you like it, shut off the heat and drain the pot. Make sure not to overcook this delicate vegetable! Top with sesame seeds or drizzle a bit of toasted sesame oil on top and sprinkle more salt as you see fit. Love baby bok choy! Haven’t cooked with it in ages, so I definitely need to do so again soon. Thalia, I love it too! Sometimes you forget about the good ones and it’s time to put them back in your cooking rotation… I just rediscovered Chard the other day! Love the simplicity of this dish, just perfect! Thank you! Thanks so much Hana! Sometimes simple really is best!